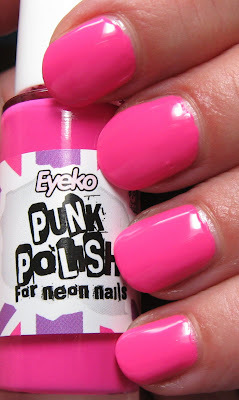 Eyeko has added a couple of new polishes to their line and I'm a bit behind, so you have probably seen these already! 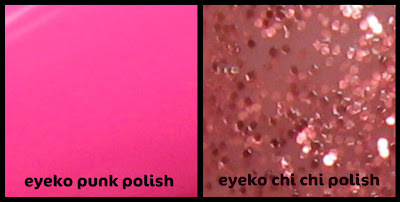 The new shades are called Punk and Chi Chi, both shades of pink, but entirely different from one another. 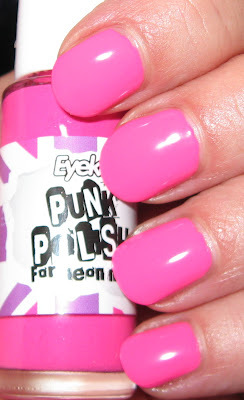 Above & Below: Punk is a vivid neon Barbie pink and is shown with a flash (above) and without a flash (below). I used 2 coats and found the formula to be a bit on the thick side, but it didn't really cause any problems during the application. This shade impressed me for a neon because it dries to a fairly glossy finish, and it covered beautifully--no streaking, which is unusual for a neon. Below: Chi Chi is a pinkish/gold glitter with a very pale pink, almost salmon colored base. I used 2 coats and got much better coverage than I expected for such a light shade. I tried it over Punk (last photo) and was a little disappointed with the uneven coverage, so I think I'll use this one be itself, as I prefer that look. Eyeko polishes can be purchased from their website, and they often have specials for free products with any order (right now they're offering a free Rain polish for orders over $15.00). I've been impressed with the formula of this brand, and they come out with new shades and finishes quite frequently. I love their bottles, particularly the label designs, because each one has a different look. While I find some of their cremes to be on the thicker side, this hasn't caused any issues for me. It seems I forget about this before I apply them, so I do add thinner after the fact, which makes the consistency of the formula more like what I prefer. Both are really pretty polishes. I don't care for ChiChi layered over Punk. Have a nice weekend Mary.